For people who have to wear glasses all the time, contact lenses can be a blessing. But if you wear contacts, like I do, you know they require some tender loving care. If you don’t do it and you continue to wear contaminated lenses, you could be in for some serious eye problems later on. 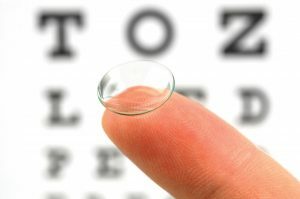 There are a number of complications that can occur from wearing contacts that haven’t been properly disinfected or used as directed by your doctor. Let’s take a look at a few of them, then learn some tips for caring for your lenses. August 21 though 25, 2017, is Contact Lens Health Week, but it’s important to practice good lens hygiene all year long. Eye problems can happen in anyone who wears contact lenses, but the risk for complications, such as infection, varies based on the type of lens worn. According to the American Academy of Ophthalmology, single-use, daily disposable lenses are the safest soft contacts for lowering the risk for eye infections. In addition, rigid, gas-permeable lenses are less likely to lead to infection than regular soft contacts. Extended-wear contacts that you sleep in pose the highest threat of infection and other contact lens-related problems. One type of infection that can occur is keratitis. Keratitis is inflammation of the cornea, the transparent layer forming the front of the eye. The cornea is especially susceptible to this type of infection due to its proximity to the contact. Keratitis is the most serious complication of wearing contacts. If untreated, it can lead to blindness. Bacteria most often cause keratitis, but in rare cases, it can result from viral or fungal infection. A germ sometimes found in tap water leads to a form of keratitis that is becoming increasingly more common in those who wear soft contact lenses. If you have bacterial keratitis, treatment is generally antibiotic eye drops. Another disorder linked to extended-wear contact lenses in blepharitis, inflammation of the eyelids that leads to dryness, burning and itching. Blepharitis can occur on it’s own, but it often coincides with dry eye syndrome. With dry eye, which affects healthy tear production, you might feel burning, irritation and itching, a foreign body sensation and general discomfort. Dry eye is one of the most common reasons people stop wearing their contacts. Eye drops are generally the first line of treatment for blepharitis and dry eye syndrome, but there are other options for treating these disorders as well. They include specialized eye scrubs, a mechanical eyelid cleaning device called BlephEx® for blepharitis and the LipiFlow® Thermal Pulsation System for dry eye. In addition to keratitis, there are other problems affecting the cornea that are possible, including corneal hypoxia, abrasions and ulcers. With hypoxia, extended contact wear can interfere with oxygen getting through to nourish the cornea. Corneal abrasions are scratches, and ulcers can form when there is erosion of the superficial surface of the cornea. Ulcers are usually related to keratitis and hypoxia. Always follow your doctor’s recommendations as well as the cleaning instructions for your lenses. Keep your lenses and supplies clean. Don’t forget to wash your hands before inserting or removing contacts. Use the lens rinse recommended by your doctor. Never use tap water to clean your contacts, and don’t put them in your mouth to moisten them. Do not wear your contacts when you swim. Thoroughly rinse your lens case and let it air dry. Insert your contacts before you apply makeup, and be sure not to any on your lenses. Replace eye makeup every three to six months to avoid contamination. Most eye doctors also recommend removing your contacts at the end of each day. Some doctors even recommend removing extended wear lenses daily.